I’m hearing an awful lot about Mike Bobo going to Georgia Southern. According to FootballScoop.com Bobo has already interviewed for the job. This is concerning as I’ve come to like Bobo as of late. Ultimately, however, Bobo-to-Southern just doesn’t make sense to me. Bobo is arguably underpaid at Georgia (he made $585,000 last year and as this article points out, he torched some much higher paid defensive coordinators). Georgia Southern’s last head coach, Jeff Monken, made just $260k. To be sure, the Eagles are likely ready to pony up some cash for a head coach as they transition to FBS, but Bobo could likely push for three times Monken’s pay as a coordinator by staying at Georgia. Furthermore, I think his stock is very much on the rise. With all the returning talent next season and the absence of a big-name QB, Bobo could be a hotter commodity this time next year. If Hutson Mason utilizes his weapons in 2014 and Georgia puts up 35-40 points per game in the first post-Murray year, Bobo will be in high demand as an offensive mind and QB developer. That, in my opinion, would be the time to make the jump to head coach. Interesting take on strength and conditioning over at Bulldawg Illustrated. I present it without commentary. If you haven’t picked up on the pattern yet, I’m updating my Bleacher Report Recruiting Piece every single day. So don’t think I’m shamelessly pushing the same post on you over and over again. I’m actually shamelessly pushing an updated post over and over again. Nonetheless, the second slide has updates on Sony Michel, Nick Chubb and Malkom Parrish. Good stuff from 247Sports. I was going to write more on Bobo, but Grit Tree already hit it out of the park. So check this out. This is the first in a series of assigned Five Paragraph Essays. Each essay was composed without outside resources and in a timeframe of fifteen minutes. It’s just like the SAT, except it’s shorter, more fun, bears no significance and I’m 26 years old. To make things interesting I’m going to write like I’m in high school. 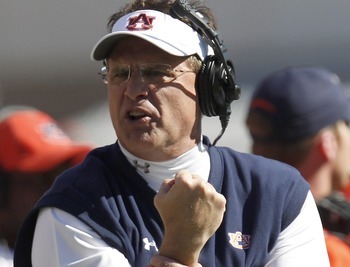 Today’s Topic: Why Auburn will win the BCS National Championship Game. Wednesday: Why Florida State will win the BCS National Championship Game. Thursday: Why no one will win the BCS National Championship Game. Friday: Why everyone will win the BCS National Championship Game. Saturday: Who will win the BCS National Championship Game? The Auburn Tigers and the Florida State Seminoles square off for the final BCS National Championship Game on Monday, January 6, 2014. For those who are fans of top-ranked teams playing each other on the football field, this game has it all – at least as far as is customary in a two-team collegiate game. Florida State enters the game undefeated with a 13-0 record and the nation’s top ranking, while the Tigers come into the game with one lone blemish and a No. 2 ranking. Despite Florida State’s advantage in the polls, Auburn will win this game because the Tigers have more talent than any team Florida State has seen, a better coaching staff than the Seminoles and a history of surviving against elite teams. If one were to look up statistics one would undoubtedly discover that Florida State is a talented team. Recruiting class rankings and NFL Draft projections would show this much. Digging a little deeper would prove Auburn is equally talented, but more importantly, Auburn is significantly more talented than any team Florida State has played this season. The Seminoles won the ACC Championship by defeating a Duke team that has less talent than most respectable high school programs. FSU’s signature win this year came against a Clemson team that was so bad it only defeated a four-loss Georgia team by three points at home. Auburn has loads of talent and that will be a problem for Florida State. That problem will be compounded by the fact that Auburn’s coaching staff is significantly better than that of Florida State. Gus Malzahn is a proven winner (even at Arkansas State) and Florida State’s head coach shares a name with a deep-sea angling boat. A guy named Jimbo Fisher won’t stand a chance against a coach like Malzahn who consistently crafts championship-caliber offenses. As a head coach, Fisher averages more losses per season than Malzahn. Losing games matters. Turtlenecks win Championships. Photo via. And losing games is not something that Malzahn’s team has done a lot of lately. Despite taking on three consecutive Top 25 teams to close out the season, the Auburn Tigers did not fold. Auburn defeated Georgia in the Deep South’s Oldest Rivalry before squashing Alabama’s dreams in the Iron Bowl and handling Missouri in the greatest conference in the world’s championship game. Florida State, meanwhile, was taking on the likes of lowly Idaho, Florida and Duke. Gridiron competition has been said to be a game of inches. More often than not, however, it’s a game of players, coaches and experience. Auburn holds an edge in all three of those categories. Accordingly, the Tigers will win National Championship. In my mind Tim Tebow already worked for ESPN. Or maybe ESPN already worked for Tim Tebow. In any event, I thought the relationship was already established, but it apparently was not seeing as the Tebow/Worldwide Leader combo was formally announced yesterday. It’s whatever. In a move that he called "Special," "Really special," and "So special," Tim Tebow has been hired by ESPN as a college football analyst. Mack Brown was gracefully destroyed by Oregon last night in his final game as coach of the Texas Longhorns. He ends his Texas career with a 158-47 record. He had one losing season (a 5-7 campaign in 2010), won the division six times, won the conference twice and won a national title in 2005ish I think (not looking up something that I should know). Most importantly, however, his potential return to coaching at another school at another time has already been set up perfectly by Mark Morrison. Navy defeated Middle Tennessee 24-6 in the Armed Forces Bowl as the only Armed Force team defeated civilians. Ole Miss held off a late surge by Georgia Tech for a 25-17 win. Texas Tech beat Arizona State’s tail. I didn’t watch these games. Can you tell? The undrafted free agent made quite an impact with the Ravens, registering 49 catches (third on the team) for 524 yards (second on the team) and seven touchdowns (first on the team). Commings missed the first nine games of the season with a broken collarbone. He registered a tackle in week 11 and also played in week 12 before being placed back on the injured reserve. The undrafted free agent registered four tackles in seven games for the Chargers. Jenkins registered 21 total tackles as a reserve. Jones, also undrafted, registered eight tackles and 0.5 sacks in eight games for the Jags. Jones missed two games this year but finished the season with 40 total tackles and a disappointing single sack. Ogletree finished 25th in the league with 117 total tackles and added 1.5 sacks, 11 passes defended, six forced fumbles (third in the league) and an INT returned for a TD. Rambo, who missed time on several occasions, finished the season with 43 total tackles and one sack. Washington, a sixth round pick, appeared in two games and registered one tackle. Williams appeared in all 16 games, primarily on Special Teams, and registered 12 total tackles. Seth Emerson wrote about the possibility of Marshall sitting out all of next year to recover, and it’s hard to argue with the appeal of it…at least as a fan. Remember, coming out of high school it was Marshall – not Todd Gurley – who was supposed to be Georgia’s back of the future. If he could recover for a full year and get some separation from Gurley he could be that back for two years starting in 2015 (assuming Gurley goes pro after his junior campaign). Granted, Marshall – the actual player – may have a plan that is better for him. Georgia practiced inside down in Jax yesterday. So can we re-open the “Let’s build an indoor practice facility in Athens” conversation yet? We haven’t had that talk in eight or nine days. Recruiting is heating up, and there are several All-Star games this week. Check out this preview of Georgia commits and targets who are playing in the U.S. Army and Under Armour All-American contests.